The Holiday Season is in full swing, so my family is quickly working its way through all the Christmas movies and specials we can get our little, sugar-coated hands on. The Polar Express is no exception. I’ve always loved the book, so I was excited to see it done up on the big screen. I wasn’t disappointed. (I know it’s got some flaws, but I don’t find it creepy.) And my dad loves it more than the rest of us. He gets mad if we go a season without watching it. The Polar Express is a refreshing break from loud, silly/sweet Christmas movies with its beautiful dark tones and deep meaning. And just when those might start to scare someone off, something fun and lighthearted shows up, like a song about hot chocolate. 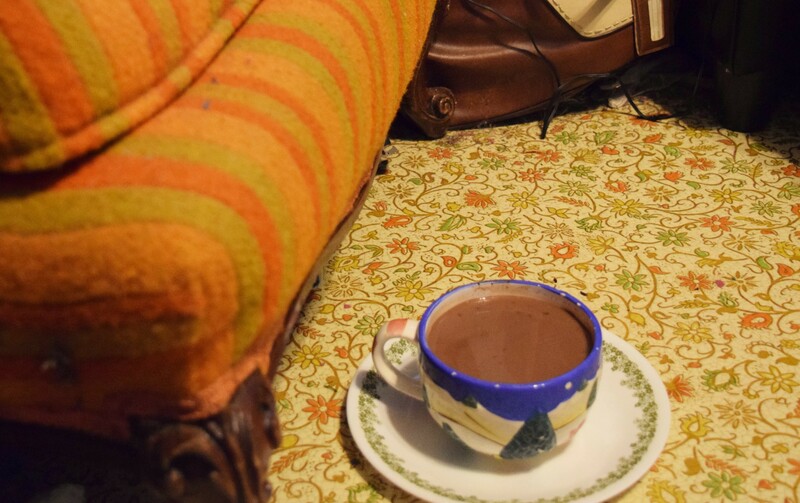 If any beverage should have a song, it should be hot chocolate. It’s warm and creamy and did I mention that it’s CHOCOLATE? That’s all the reason it needs to be the refreshment of choice aboard a magic train. Recipe makes about 5 servings or 2 really big ones. In a medium saucepan, combine chocolate milk, heavy cream, sugar, cocoa powder, and salt. Cook over medium heat, stirring occasionally, until sugar, cocoa powder, and salt dissolve and the milk mixture starts steaming. Don’t let it boil, though. Add about half of the chocolate and stir until it completely melts. Add the remaining chocolate and stir until the chocolate has melted and the mixture is smooth. Remove from the heat and stir in the vanilla extract. Divide into mugs and drink up! Every Christmas Eve, I look out my window before bed, hoping to see the Polar Express waiting to take me on a trip to the North Pole. It hasn’t shown up yet, but I won’t let that shake my belief in the “Big Man.” At least I’m always welcomed to Christmas Day by a nice cup of hot chocolate. This drink is fine all year round, but there’s something about Christmastime that makes it just a little bit sweeter.